7 Comments on "Blue Water, Green Water"
For years, I have been shaking my head as reporters are surprised by flooding along river banks every Spring. STOP BUILDING ON YOUR WATERSHED, FOOLS!!! Alleluia! How true. Exceptional drawing and content.Way to go Stewie!! Thanks for making such a complicated issue much easier to understand with your skilled artistic abilities. I shared this with our group in Florida that deal with water problems everyday. It was very well received. I hadn’t thought about this but, it’s worthy of considerable thought. I can’t off hand guess the actual impact. The total amount of water on the planet shouldn’t change. The amount of atmospheric water would. So, fewer clouds equals more radiational cooling. Deserts are more reflective than jungles. The overall effect on albedo is unclear to me. Less carbon sequestration equals more green house effect.I don’t know where that leaves the planet. Probably, the impact on the blue water cycle will be a marked reduction and in this increasingly overpopulated world the consequences on the human population will be disastrous. The planet may be better off long term, because of less of us. I should reexamine my suggestion that the total amount of water should be more or less constant. Mars lost it’s water the reasons are unclear. We really need to start acting on the water issue. Somehow, I think the efforts to stop the kitchen faucet drip, while well intentioned, grossly underestimates the measures that must be undertaken soon. We have precious little time to preserve this precious blue gem, that so far as we know is the only outpost of consciousness in an otherwise mechanistic cosmos. 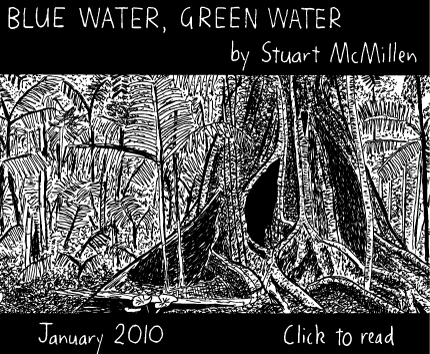 Yikes – I studied ecology and I’ve never heard of this term ‘green water’. But the point you make is so true… fab!